In 1999 the world risked losing sight of on-going disarmament efforts as wars such as Kosovo and Chechnya took the headlines. Nuclear arms negotiations stalled, 'old' conflicts continued, and the United States extended its role as the dominant military power, prompting a debate in Europe as to its own military structures and function. 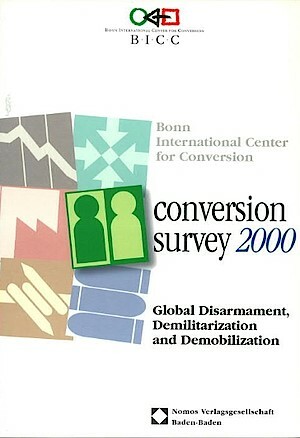 Against this backdrop, the conversion survey 2000 of the Bonn International Center for Conversion (BICC) directs attention back to the tangible achievements in disarmament over the last two years such as initiatives against landmines, small arms and the use of child soldiers, as well as progress in Northern Ireland. The Update section includes the BICC disarmament index and provides an overview of regional/country trends in five of BICC's issue areas: military expenditures; military research and development; restructuring and conversion of the defense industry; base closure and redevelopment; disposal of surplus weapons. The Topic highlights demobilization and reintegration, describing policy tools available for managing these in different types of society: western market economies, transition countries and post-war situations.